The 2016 Toyota Avalon is the flagship of the automaker’s car fleet. In 2013, the sedan underwent a massive revamp. Sporting a more sophisticated look and a premium interior, the full-size car gets some mild upgrades for the 2016 model year. Cruise through Chicago in style with an exterior that has been redesigned with a new front grille, a revised rear and new wheel designs. The trim levels have been reshuffled with select ones re-tuned for an even more comfortable ride. The 2016 Toyota Avalon seats five and is offered in two models: gas-powered and hybrid. This review focuses strictly on the former. Shoppers have five distinct trim levels to choose from. The XLE is the base Avalon. Parking in Chicago can be tough but it’s easier with a rearview camera system, anti-lock disc brakes, and traction and stability control systems are just some of the safety features found standard at this trim level. Also standard are power front row seats, leather upholstery, Bluetooth audio and phone connectivity and Entune, Toyota’s advance telematics and infotainment system. The XLE Plus builds on the XLE with a sunroof and keyless entry, i.e., fob. The XLE Premium is the mid-level trim of the lineup. It adds on a slew of features, especially in safety. A blind-spot monitoring system is standard. Same with rear cross-traffic detection. Other features of note include a nine-speaker audio system and a wireless recharging plate for smartphones and similar devices. The Touring separates itself from the rest of the Avalon line with an exclusive interior design and a sport-tuned suspension. Unsurprisingly, the top-level Limited is jam-packed with virtually all the equipment and features from the lower trims. Exclusive bits to the Limited include an even more premium leather upholstery, xenon headlamps, heated rear seats and a top-notch 11-speaker audio system. The Avalon Limited is also the only one offered an option package (Toyota Safety Sense) for buyers to further customize their sedan. 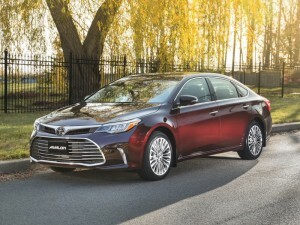 A single 3.5-liter V-6 powers all Avalon models. It carries over from last year.